The Lensic Performing Arts Center proudly presents Wise Fool New Mexico’s fifteenth annual Circus Luminous. 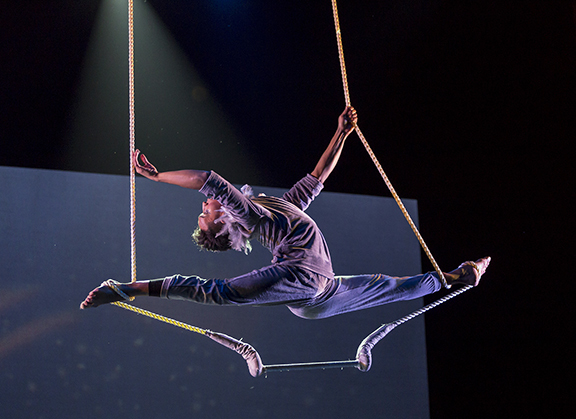 The all-new, all-local production, this year subtitled “Clown Alchemy,” features an ensemble of red-nosed clowns plus a cast of amazing acrobats, aerialists, and dancers (eight of them under age 15) performing feats of daring and wonder to delight audience members of all ages. The production follows six red-nosed clowns as they journey through the landscape of modern-day life fraught with issues that face Americans in 2018: school violence, immigration rights, women’s rights, black lives, trans issues, and indigenous resilience. The clowns, played by Amy Christian, Sarah Jane Moody, Dee Anaya, Carey Kramer, Kayo Muller, and Susie Perkins, bring their brand of healing to the world. “It’s entertaining and hopeful while also speaking to concerns that even school children encounter today,” says Ruffin. “We explore the magic that can turn these issues around, as well as the love and compassion that we all can bring into the mix. You’re gonna love it!" “Clown Alchemy” features an original score by music director Brian Haas, performed live by the Circus Luminous Orchestra. The production also features stunning visuals and costuming by a host of local builders and artists. Friday • November 23 • 7 p.m.
Saturday • November 24 • 2 p.m.
Saturday • November 24 • 7 p.m.
Sunday • November 25 • 4 p.m. The nonprofit Lensic Performing Arts Center, a landmark historic theater in the heart of Santa Fe, is home to arts and cultural experiences for everyone, all year round. The Lensic serves its community through world-class artistic programming (including our Lensic Presents series), theater rentals with discounts for local nonprofits, and groundbreaking educational programs that touch the lives of 16,000+ students each year. For more information about our presentations and programs, visit www.lensic.org. Circus Luminous is generously sponsored by Los Alamos National Bank.